Arizona enters the new decade as the national leader in school choice. 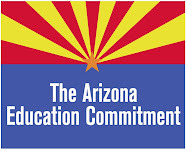 Arizona parents can choose to open-enroll their children in the public school that best meets their needs, choose among almost 500 charter schools or even receive a tax credit funded scholarship to offset some of the cost of private school. Arizona parents have more choice than parents in any other state. Unfortunately, while Arizona legislators have given parents more control over their children’s education, they have failed to keep up with other states’ investment in education. Arizona ranks at the bottom in per pupil spending for public education and 90% of Arizona parents have chosen traditional public education and charter public schools. Why is investment in traditional and charter public schools important? In order to have a strong economy Arizona needs an educated work force to attract industry to the state. If business cannot find workers qualified for the positions available they will not come to Arizona. Moreover, if educated workers are not available businesses will leave Arizona. Arizona citizens want smart government that will enact policies that will help create broad prosperity throughout the state and education is the cornerstone to building a stronger Arizona economy. Investing in public education is investing in the economic future of Arizona. As the legislature convenes for the new session, Arizona faces serious financial issues. Arizonans should be watching for action in the legislature that reflects Arizona values and priorities. New tax-credit proposals that diminish the general fund in a time of record deficits should be labeled fiscally irresponsible. Investment in public education should be employed to fire-up the economic engine of Arizona and help grow us out of our fiscal Grand Canyon. Investment in public education has been the greatest economic driver in the history of the United States. Now is the time for Arizona to re-invest in public education!